For starters my bottom is already shaped like an airline seat, so I’m eminently equipped for the role. Plus stories are my life. Writing them, reading them, thinking about them and shelving them alphabetically (in an amateur capacity) has been my daily passion for as long as I can remember. And, in addition to all that, Ron’s timing was uncanny. I’ve been thinking for many years about the place of stories in our lives and forming the view that young people need stories more than ever. Stories to delight, stories to beguile, stories to move deeply, stories to inspire. Stories that will equip young readers to embrace an often dark and uncertain world with optimism, resolve and creativity. I know what you’re thinking and you’re right. Stories have always offered these things to young people. The pages of their literature have always been alive with girls and boys grappling with big problems and discovering much about themselves and their world, including the huge amount they themselves are capable of. ‘Many things,’ I hear you murmur. ‘Many useful things.’ And you’re spot on. When we plunge into a story, not only do we have spills and thrills, horror and hilarity, ideas and insights, all from the comfort of our own reading pillow. We also get to see what individuals like us are capable of. And it doesn’t stop there. The more we read, the more we develop our creativity, empathy, bravery, honesty, curiosity, resilience, cheekiness, emotional intelligence, manipulation-spotting ability and problem-solving skills almost without realising it. And when we finish our reading and turn back to the real world and notice the size of some of the problems there, we flinch but in a resolute sort of way because we know we have stories on our side. If that seems a bit far-fetched, have a squiz at the calendar on the poster tucked between the pages of this issue. (If a curious year four kid’s been here before you, or a light-fingered librarian, it’s also online). 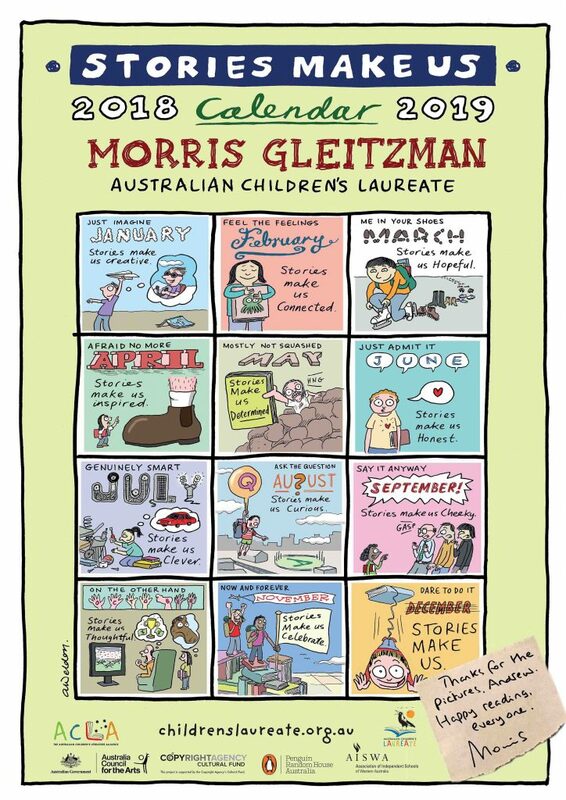 The calendar is a reminder that each month on the laureate website I’ll be exploring in more detail one of the above qualities and how the problem-strewn landscapes of stories give both protagonists and young readers the chance to discover these qualities in themselves. I’ve been to a couple of thousand schools in my career. My main focus on these visits, apart from spending valuable time in the staffroom working out which is the visitor’s mug, has been listening to young readers talk about their reading. Learning what it is that really keeps them turning the page. Which of course is to find out what happens next. But not just on the physical surface of the story. More crucially, in the deeper places. The realm of characters’ thoughts and feelings, fears and hopes. The place where they are most like us, their inner world. The discovery of how much we all share inside, regardless of our physical and circumstantial differences, is a source of great reassurance to young readers. The knowledge that the fragile web of hopes and fears we hold inside ourselves is also to be found inside playground bullies and loving parents and presidents of the United States is a good and useful knowledge to have. It nurtures the single most fervently-held hope of young people – that the best our species is capable of is more powerful than the worst. Adults also want this to be true. And so I’ll champion children’s stories to adults as well. Encourage them to see that kids’ stories are as worthy of their attention as anything that happens in their corporate and political worlds. Challenge them to look deeply into the stories the children in their lives are reading and to be open to what they find there. Show them how they too might come away from the pages inspired, determined and hopeful. Remind them that reading to and with young people, that simple timeless human gift, is one of the most precious we can offer. A gift that in its form and content champions love. In our busy adult worlds this is easy to forget. Young people would rather we didn’t. 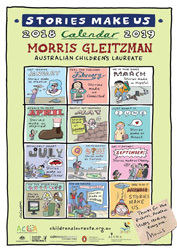 And so I aim to be not just a laureate, but also an ambassador. An emissary from the place where young imaginations draw strength from stories and grow and engage and become our best hope for the future. In this endeavour I’ll be walking in some mighty footsteps, including those of my esteemed Australian predecessors Leigh Hobbs, Jackie French, Monty Boori Pryor and Alison Lester, as well as many other inspiring individuals from the other countries that have children’s laureates. I’ll also be conscious during my time that others will be following. That the Laureateship is bigger than any one of us and its stature and relevance is a collective responsibility. And so in the many motels where I’ll be laying my head over the next two years, I’ll be sure to pick up the towels before I check out. I look forward to meeting some of you along the way, having a cuppa and continuing the conversation I’ve kicked off here. I’ll probably also show off my new skill with sporting metaphors. Ron, thank you for the offer, the vote of confidence, the trust of you and the ACLA board, and the most persuasive drink I’ve ever been bought. The goals we’ll be working towards over the next two years and beyond won’t be easy, but they’re not impossible.